In OFDM-based space division multiple access (SDMA) systems, multiple users are served by a multiantenna base station simultaneously on the same frequency resources. In the uplink, each user's signal may be distorted by an independent carrier frequency offset (CFO), which impairs the orthogonality of the subcarrier signals and, if not properly compensated, results in performance degradations. We analyze the influence of multiusers' CFOs on the signal transmission in the OFDM-SDMA uplink and derive suitable bounds for the achievable signal-to-interference conditions. By modifying the signal model suitably, we develop a simple scheme for partial compensation of the CFO distortions. It allows to maintain the subcarrier-wise channel equalization and thus is well suited to be applied for a real-time system implementation. However, as CFOs impair the cyclic structure of the OFDM symbols, our scheme is not able to compensate for the entire distortion. The remaining interference is treated as additional noise, which limits the supported size of the CFOs. A promising solution to lead wireless communication systems toward high spectral efficiencies is the combination of the orthogonal frequency division multiplexing (OFDM) together with the space-division multiple access (SDMA) technique . In the SDMA uplink, multiple users communicate simultaneously with a multiantenna base station (BS) on the same frequency resources by transmitting their signals on different spatial layers. OFDM is a favored technique for the transmission in frequency-selective channels, as it facilitates the equalization process while at the same time enabling high spectral efficiencies. However, one of its deficiencies is its high sensitivity towards time-variant distortions. In general, these destroy the orthogonality of the single subcarrier signals and give rise to the so-called inter-carrier interference (ICI), limiting the achievable system performance [2, 3]. One source for time-variant distortions is the carrier frequency offset (CFO), owing to a mismatch between the oscillators at the transmitter and receiver sides. While estimation and compensation of CFO distortions in a single user link are fairly easy and conveniently solved [4–6], coping with different CFOs from multiple users in any OFDM-based multiuser uplink is much more challenging, as all CFOs need to be estimated independently, and the conventional techniques for compensation do not apply. The influence of CFOs from multiple users in an OFDM-based uplink has been studied extensively in the context of OFDMA systems, where simultaneous access is granted to multiple users by individually assigning distinct sets of subcarriers to them [7–9]. An overview of existing synchronization techniques together with a sound summary of the general requirements for uplink synchronization can be found in . Estimation of multiple users' CFOs can be performed based on blind techniques exploiting specific properties of the utilized OFDM signals and their statistics [11–15] or based on pilot-based techniques [16, 17]. For CFO compensation, the simplest approach is to feed back the estimated CFO to the corresponding user terminal, so that it may adapt its oscillator accordingly or apply a precompensation to its transmit signal . However, the drawback of this feedback approach is that large delays may occur before the CFOs are properly compensated. There also exist some proposals for CFO compensation to be carried out directly at the receiver by adequate signal processing. These approaches are either based on the inversion of a high dimensional matrix representing the ICI-affected channel for a complete OFDMA symbol [18, 19], or they make use of successive interference cancelation techniques , which may be performed in an iterative fashion . Unfortunately, all these approaches result in a significant increase of computational complexity compared to common OFDM processing, whose favorable property is to enable an independent subcarrier-wise processing. Although the complexity of the aforementioned approaches based on matrix inversion can be further reduced if specific properties of the signal model are exploited [15, 22, 23], it still remains considerable. A suboptimum solution maintaining the subcarrier-wise signal processing at the receiver is presented in . The user signals are separated first, whereafter they are individually compensated for their user-specific CFO. Although not all ICI can be removed, a satisfactory performance is achieved if the CFOs do not become too large. The major difference in OFDM-SDMA systems is that the channel is enhanced by a spatial dimension. To separate the users' signals, knowledge of the SDMA channel per subcarrier is required. With CFO distortions present, solutions to estimate the SDMA channel have been proposed in [25, 26]; joint estimation of SDMA channels and the users' CFOs can be found in [27–29]. Contributions [26, 28] also provide approaches to compensate for the CFO distortions at the receiver, which, however, have complexity demands that are similar to the OFDMA techniques mentioned earlier. The work in this paper was motivated by seeking for a simple receiver-based CFO compensation method for the uplink of an OFDM-SDMA system. Hereby, the subcarrier-wise channel equalization is supposed to be maintained to facilitate implementation in a real-time system. Therefore, we resort to the basic idea from  and develop a system concept where the user signals are first separated by common OFDM-SDMA equalization and compensated for their individual CFO distortions afterwards. As this approach is clearly suboptimum, the major focus of our work lies in the proper analysis of the achievable signal conditions with respect to the amount of interference that remains in the system after such compensation. In particular, we derive closed-form expressions characterizing the bounds for the signal-to-interference ratio (SIR) before and after CFO compensation, which are verified by numerical bit-error rate analysis. This way, we obtain insights into the suitability of the approach and reveal the limits of its application range. Based on our results, it turns out that the proposed CFO compensation concept operates conveniently only if the size of the CFOs present in the system can be kept below a few percent of the subcarrier spacing. Therefore, the approach has to be seen as a technique for fine-synchronization. Correspondingly, a coarse-frequency synchronization of all users' signals has to be ensured. This coarse synchronization can be achieved by a frequency-advance, where terminals precompensate their signals with the CFO estimated in the downlink phase. The concept of frequency-advance was recently realized in a practical system, as reported in . In , we already presented the basic idea of this work and initial analytical results. Here we extend the analysis to support linear receivers providing spatial diversity gains, add the case of noncompensated CFOs for illustrative comparison and provide a refined update of the CFO compensation process to be carried out in frequency domain, which facilitates implementation. The paper is structured as follows: Section 2 introduces the OFDM signal model based on vector notation. As a preparation for analysis of the OFDM-SDMA system, we determine the SIR conditions for a single antenna OFDM link in Section 3. Hereafter, the model is modified to form the basis for the simplified CFO compensation process in OFDM-SDMA systems. In Section 4, we analyze the SIR conditions in the OFDM-SDMA system and derive bounds for the two cases where CFOs are compensated according to the proposed scheme and where they are not. These bounds are verified by simulation results in Section 5. Notation. We use bold capital letters to denote matrices and bold letters for vectors. Scalars are written in italics. and denote conjugate transpose and conjugate operator, respectively. refers to the trace operator. represents a diagonal matrix, whose diagonal is constituted of vector . denotes the expectation operator. Note that is unitary thus equals the identity matrix . Next the focus is turned to an OFDM-SDMA system, where single-antenna terminals transmit their signals simultaneously to an -antenna base station on the same frequency resource. The users' transmission signals propagate via different paths and will be marked with different spatial signatures, which enable the multiantenna receiver to separate and recover the users' transmission signals. where each of the single user/receive antenna links is characterized by its own diagonal channel matrix . In the OFDM-SDMA system, the channels of the single antenna links are characterized by the same statistical properties, but are assumed to be statistically uncorrelated. In particular, we assume all channels to have identical channel length and identical PDP, which may be reasonable for user terminals experiencing non-line-of-sight (NLOS) multipath fading. To prepare analysis of the SIR conditions in the OFDM-SDMA system, we focus in this section on a separate single-antenna OFDM link. In the following, we analyze the impact of CFO distortions and derive a bound for the SIR (Section 3.1). To enable a simplified equalization process in the OFDM-SDMA system, where the user signals are first spatially separated and thereafter individually compensated for their CFO distortions, we modify this signal model accordingly (Section 3.2). This model introduces an additional error term, which cannot be compensated by simple means. Hence, its power and the resulting SIR conditions are analyzed in Section 3.3. The proper process for partial compensation of the CFO distortions after channel equalization is then presented in Section 3.4. Multiplying the circular matrix with a frequency-domain signal vector represents a cyclic convolution of that signal vector with function , which introduces the ICI. For , specifies the amount of ICI, that is, induced on any subcarrier from a subcarrier signal which is spaced subcarriers apart. itself represents the attenuation of the power of each subcarrier signal. From (10), we observe that multiplication with function imposes a constant phase rotation on all subcarrier signals. This constant phase factor corresponds to the mean CFO-induced phase rotation observed over the total duration of the time-domain OFDM symbol of samples length. It is also referred to as the common phase error (CPE) induced by the CFO distortions. Correspondingly, the diagonal of represents the DFT of . We observe that the elements in this submatrix reflect the (complex) difference of the effective channel echoes seen by the samples in the CP and their cyclic repetition at the end of the OFDM symbol. If these two signal fractions are no longer identical owing to the CFO, the periodic property of the OFDM signals is violated, resulting in interference to all subcarrier signals. With this finding, the total CFO-induced interference contained in model (17) can be segregated into two different types: the first type is given as ICI of the original subcarrier signal in , generated by the cyclic convolution in , and the second type is given as interference caused by the violation of the periodicity of the OFDM signals, represented in the term . If equalization and CFO compensation are carried out as described earlier, the power from will remain in the system and distort the signal as interference. In the following, we will therefore analyze its power as well as the resulting SIR conditions. where the relation holds with equality for a uniform PDP. indicating that the mean interference power is uniformly spread over all the subcarrier signals. can be interpreted as a delimiter of the region around any subcarrier at position where the power of the interference is highly correlated; we thus denote it as interference correlation range. The distance grows inversely proportional with the channel length ; a short channel length thus results in a high correlation of the interference. We will see later that the correlation of the interference supports a simplified CFO compensation process, which yields an improved error performance. Further, it has to be considered that the interference contained in the term from (17) is constituted of two different types, which affect the signal conditions at subcarrier position differently. In particular, we encounter self-interference stemming from the signal at subcarrier itself, which is represented by the diagonal elements in , and ICI-like distortion stemming from all other subcarrier signals, which is represented by the off-diagonal elements of . As the transmit symbols in are assumed i.i.d., the ICI can be assumed to be uncorrelated with the signal at subcarrier , and hence the distortion effect due to the ICI can be considered similar to the one of additive white Gaussian noise (AWGN). The self-interference, however, may be strongly correlated with the signal at subcarrier and thus may directly influence its signal level in a deterministic fashion. However, in the appendix it is shown that the influence of the deterministic distortion evoked by the self-interference is negligible if holds, and consequently we may consider the total interference from as pure ICI-like distortion here. We observe that an increasing channel length decreases the SIR proportionally. As the proposed CFO compensation process ignores the error , we will not be able to overcome this SIR bound, even if the distortion measures and needed for the compensation process are estimated perfectly. To illustrate the obtained results, Figure 1 compares the SIR bound for an uncompensated CFO from (12) with the SIR bound (28) achievable after applying the simplified CFO compensation process. The amount of interference power that can be removed by the suggested process corresponds to . If , the interference can be removed completely by the CFO compensation process. For increasing , however, an increasing share of the interference power is contained in the term in (17), remaining in the system after compensation. If we set and solve for , we obtain the channel length where the compensation process is not capable of providing any gain. The minimum value for this length is obtained for , yielding . This means that if , the gains delivered by the CFO compensation process become vanishingly small, so that its application will no longer be suitable. In Figure 1, this can be observed as the curves approach the curve for decreasing values of . For , the SIR gains achieved after compensation for small CFOs have become already very small. SIR conditions for uncompensated CFO (12) and compensated CFO (28) based on the signal model in (17). where is the th symbol of vector , and is the th subcarrier signal obtained after equalization and CFO compensation. To specify a suitable value for the delimiter , note that is distorted by interference from , which is strongly correlated over the interference correlation range specified in (27). Furthermore, note that given in (10) is near to being point-symmetric, that is, holds. This near point-symmetric property of results in the fact that the correlated interference affecting the subcarrier signals in close vicinity of subcarrier is canceled out almost completely in (29). For that reason, it seems to be reasonable to set the delimiter , where denotes the integer nearest to . Interestingly, simulation results presented in Section 5 show that we are able to achieve a slight performance improvement with this selection compared to the full CFO compensation, where the interference from the total subcarrier signals is taken into account. Note that CFO compensation according to (29) can be realized with comparatively small demands on system complexity. Firstly, for practical system setups, can be limited to small values. Furthermore, in (10) exhibits a single complex factor independent of , which represents the CPE. Compensation of the CPE can be incorporated into the channel equalization process. Therefore, (29) reduces to a convolution with a simple, strictly real-valued function. Recall the OFDM-SDMA transmission equation from (6). If we want to equalize the effective channel completely, the only viable approach based on linear techniques is to invert the entire channel matrix —which relates to the approach for OFDMA systems conducted in [18, 19]. However, this matrix is of dimension , and hence the complexity of this approach will quickly become infeasible for practical realizations. Although complexity can be reduced by exploiting the block-diagonal band structure of this matrix, it still remains considerably high. Moreover, as CFOs induce phase rotations of the effective subcarrier channels over time, the matrix changes every OFDM symbol and thus has to be recomputed frequently, which increases the complexity for the inversion-based compensation even further. where , and are the matrices constituting the compound channel matrix above. Evidently, this notation enables the two-step equalization process introduced in the previous section. We first equalize the channel contained in matrix by a subcarrier-wise equalization of the flat-fading SDMA channel and thereby spatially separate the single user signals. The separated user signals may then be compensated individually for their CFO distortions as described in Section 3.4. The entire receiver processing for the simplified CFO compensation in the SDMA system is illustrated in Figure 2. Receiver processing for simplified signal reconstruction with CFO compensation in the SDMA uplink. In what follows, we will analyze how the CFO-induced interference will affect spatial diversity gains that can be achieved with a linear multiantenna receiver. As there is some correlation between signal and interference channels, distortion effects from the interference can no longer be expected to be similar to the one of AWGN. In particular, we will analyze the degree of correlation between the channel of the useful signal and the interference channels and derive SIR bounds describing the equivalent situation for AWGN. Analysis will be carried out for the case of no CFO compensation and compensation according to the proposed scheme separately. In a brief intermezzo, we derive the basic relations concerning spatial diversity gains that are achievable with linear receivers in case of correlated signals. These relations form the basis for the analysis of the signal conditions in CFO-distorted OFDM-SDMA systems, which will be performed in the succeeding subsections. In particular, we examine here how interference that propagates via a correlated channel will affect the signal conditions at a multiantenna receiver providing spatial diversity gain . Following the notion from , the spatial diversity gain can be illustrated by assuming a maximum ratio combining (MRC) receiver that combines the signals from independent receive antennas. Assume a signal with mean power , which is transmitted via independent Rayleigh-fading channels with unit mean power. At each receiving antenna , the signal is distorted by AWGN with power . MRC operation then yields a post-MRC signal-to-noise ratio (SNR) of . The SNR thus is increased by factor compared to the SNR of the signal at a single receive antenna. Thus, represents the effective SNR loss factor owing to the channel correlation . Evaluating this measure for varying reveals that for , suggesting that the useful channel and the interference channels for the ICI generated from are nearly fully correlated. Evidently, this results mainly from the high-frequency correlation of subcarrier channels that is valid for . This result is equivalent to the SIR bound for the single-antenna case (12), reduced by the effective SIR-loss factor . Again, we define as the useful signal. The proposed equalization and ICI compensation concept removes the interference from as well as the the ICI induced by , and correspondingly solely the interference from remains in the system. Equivalently to the analysis carried out in the preceding subsection, we will now determine the correlation between useful channels and the channels of the residual interference to specify achievable spatial diversity gains. However, to ease analysis here, we initially focus on the entire channel matrices and to specify the overall statistical properties. Afterwards, we determine the signal conditions per subcarrier signal by averaging over the total subcarriers of the system. where we used the bound for from (25), and should be used as specified in (56). This expression is equivalent to the SIR bound found for the single-antenna case in (28) reduced by the effective SIR-loss factor . Note here that the CFO-induced interference scales with the number of parallel SDMA users . In case of full correlation ( ), the SIR-loss factor is identical to , the factor found in case of no CFO compensation in (49). As a major result, we conclude here that the correlated interference from the CFO distortion results in an increase of the effective SIR-loss if a receiver with spatial diversity gain is employed. where is a vector consisting of AWGN samples with power . Thus, the mean reception SNR amounts to for the signal of any user at any receive antenna. As we have indicated that the CFO-induced interference can be expected to behave like AWGN, it can be assumed that this interference degrades the interference-free AWGN performance (i.e., no CFO is present) according to the amount of interference power. 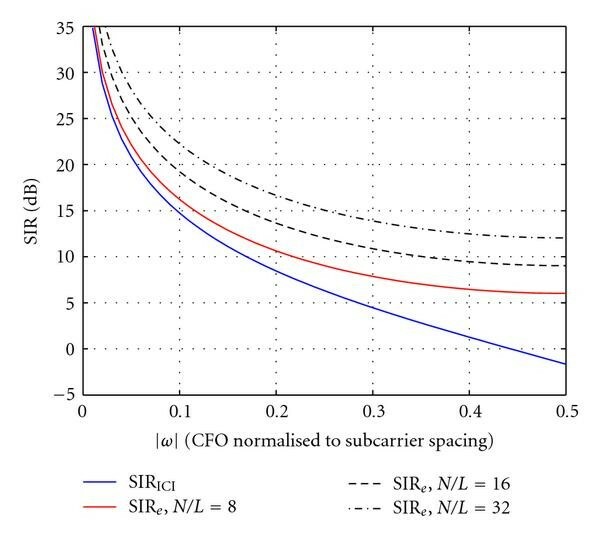 In particular, if the SNR is equal to the CFO-induced SIR, we can expect that the transmission experiences a performance degradation of 3 dB compared to the interference-free case. (As interference and AWGN are assumed to be independent, their joint distortion can be considered as Gaussian-like with power equal to the sum of powers from the two independent processes.) This basic principle will be used to verify the SIR bounds derived in the preceding sections. We consider an OFDM-SDMA system with subcarriers, where single-antenna user terminals are granted simultaneous access. For the bounds to be tight, all subcarriers are occupied with transmission symbols from both users. The channel between each antenna link is modeled as Rayleigh-fading with channel taps and a uniform PDP. The normalized CFO is fixed to . As a performance measure, we use the bit-error rate (BER) that is achieved for an uncoded transmission of uncorrelated 16QAM symbols, averaged over both users. We use a zero forcing (ZF) equalizer to equalize the channel distortions and spatially separate the user signals per subcarrier. The diagonal channel from (31) as well as the CFOs are assumed to be known perfectly at the receiver. Based on the signal model (17), we first examine the achievable performance for a single-antenna link (SISO). Results are given in Figure 3. The solid bold line shows the achievable BER performance in case no CFO is present. The suggested compensation approach shows a significantly degraded performance. At an SNR equal to the SIR bound (28), which amounts to 19 dB for the given parameter setting, it clearly exhibits a performance loss of 3 dB. This observation thus verifies the bound derived in (28). BER performance of SISO system distorted by normalized CFO . The performance curve of the CFO compensated system runs into an error floor for high SNR that corresponds to the BER performance achievable with the CFO-free performance at about 22 dB—which is about 3 dB higher than the SIR bound. The reason for that can be found in the distribution of the interference generated from the distortion terms in in (17). Note that the values in are generated from products of the independent random variables in and the data symbols in , which are all assumed to be Gaussian. The resulting distribution function for the values in is thus in general no longer Gaussian. Instead, we observe that the majority of the values from this distribution is much more concentrated around their mean than in the Gaussian case. Due to this fact, the achieved error floor is significantly lower than it would be if the interference behaved like Gaussian noise with identical power. However, it is worth noting that with increasing and thus with an increasing number of independent variables in , the distribution of the values in approaches the Gaussian case—thanks to the central limit theorem. If we apply the CFO compensation technique that removes the ICI from the subcarriers in close vicinity only (see Section 3.4), we obtain the performance given by the dashed line for . Interestingly, for the choice of according to given in (27), the CFO compensation accounting only for some of the ICI distortion achieves a slight performance improvement compared to the full CFO compensation. Obviously, this is a benefit related to the correlated interference from in (17), as detailed in Section 3.4. If we do not compensate for the ICI caused by the CFO but compensate for the CPE only, which corresponds to the case of applying the compensator (29) with , we obtain the performance represented by the uppermost curve. 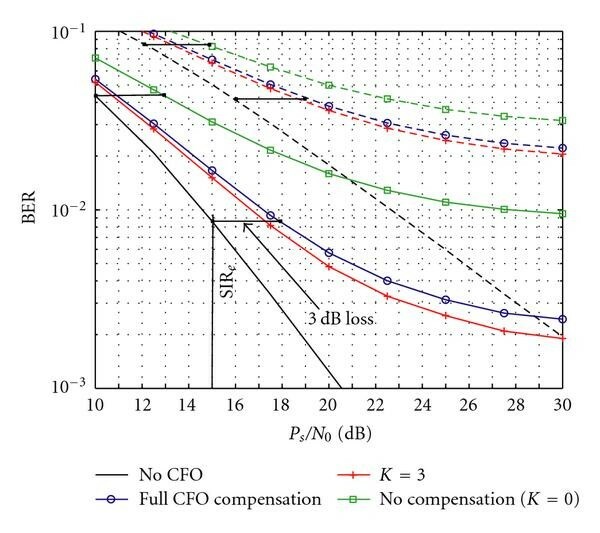 For an SNR equal to the bound in (12), which amounts to 15 dB for the given parameter setting, we clearly observe a performance loss of 3 dB compared to the performance where no CFO is present. For the 2-user SDMA case, we consider ZF equalization to separate the signals of the different users. In  the diversity gain delivered by the ZF receiver has been shown to yield . For our examinations, we consider two cases: a receiver with and antennas, providing a diversity gain of and , respectively. Performance results are shown in Figure 4. The dashed curves refer to , while the solid curves refer to . 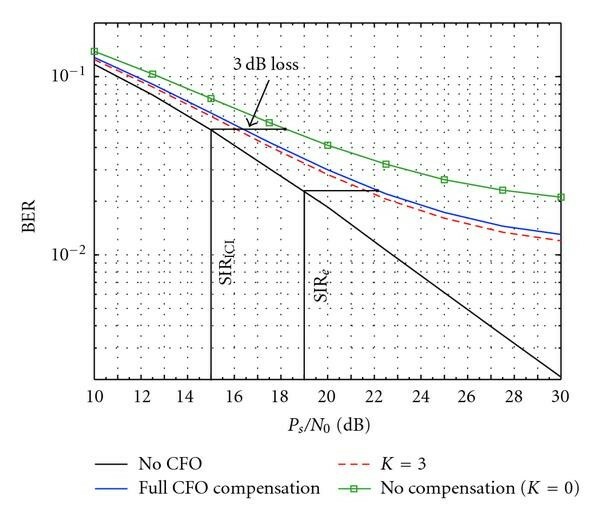 The curves representing full CFO compensation according to the proposed scheme exhibit a 3 dB performance loss at an SNR equal to the SIR from (58) compared to the curve of CFO-free transmission, which amounts to 16 dB for and 15 dB for , respectively, for the given parameter setting. These losses are highlighted in Figure 4 by the horizontal black lines, clearly verifying the bound derived in (58). As in the SISO case, we observe that we can achieve a slight performance improvement if we use the simplified CFO compensation process based on (29) with . In case we do not compensate the ICI caused by the CFO, we achieve a severely degraded performance, which clearly exhibits a 3 dB performance loss at an SNR of 12 dB for and 10 dB for , respectively, corresponding to the analytical bound (49). In Figure 5 we examine the behavior of the BER when the CFO compensation process based on (29) is applied for different values of the delimiter . We focus on a constant SNR dB, which reflects the BER of the error floor for . For the selected values of , the subcarrier correlation range from (27) amounts to and , respectively. Interestingly, the corresponding curves exhibit their minimum at and , respectively, which is the nearest integer to . Hence, selecting indeed seems to be a good choice. This result leads us to the conclusion that it definitely suffices to consider only the subcarrier signals in closest vicinity within the CFO compensation via (29). BER performance at SNR = 20 dB versus delimiter . . The numerical evaluation of the effective SNR loss for various CFO sizes is depicted versus the SNR in Figure 6; the corresponding parameter setting is specified in its caption. 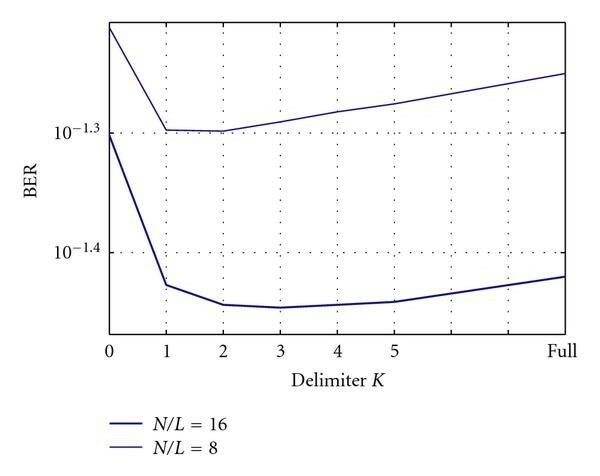 In accordance with the observations drawn from Figure 4, where evaluations where based on a CFO of size , the corresponding curve indicates here a 3 dB SNR loss at an SNR 16 dB. For comparison, we also added the SNR loss for the case of no ICI compensation (dashed curves), where we used the interference power bound from (49). Although we observe that the proposed CFO compensation is able to reduce the SIR loss significantly, it still increases steeply for increasing CFO size . If the CFO amounts to 20% of the subcarrier spacing, the performance of the system is degraded by 3 dB already at an SNR level of about 10 dB. SNR loss after CFO compensation versus SNR for CFOs of different size . Solid line: ICI compensation. Dashed line: no compensation. . These results show that the system's sensitivity toward CFO errors is still very high, and hence we conclude that with the suggested approach, we can conveniently compensate CFOs of small size only. Thus, the method is suitable for a fine-frequency synchronization only, and hence it has to rely on a coarse synchronization, which has to be established in advance. In a practical system, such a coarse synchronization can be achieved if the terminals use their frequency estimates obtained during the preceding downlink phase for a proper frequency precompensation of their transmit signals. We denote this as frequency advance, which has been the basic concept for our real-time system implementation that has been reported in . It is worth noting that the analysis presented in this paper and in particular the derived bounds for the SIRs served as an important guideline in preparing the experiments that have been summarized in that reference, which have shown that a convenient system operation in a practical setup can be achieved. Finally, note that if the CFOs are kept small, the signal degradation from ICI is limited, and thus common pilot-based channel estimation techniques can still be used to obtain channel estimates of sufficient quality. The more pilots available in one OFDM symbol can be used for that channel estimation, the better the ICI can be suppressed, as the ICI behaves similar to AWGN. Moreover, the CFOs of the single users can be obtained from observing the phase drift of the estimated subcarrier channels over several successive OFDM symbols. With (10), the ICI coefficients can then be determined, which can finally be applied in (29) for proper ICI compensation of the single users' signals. We have investigated OFDM-SDMA uplink transmission in the presence of multiple users' CFOs. We modified the common signal model suitably to enable a subcarrier-wise SDMA equalization followed by a user-specific CFO compensation, yielding a simple equalization process ready to be applied in practice. However, as CFOs violate the periodic structure of the OFDM signals, some interference remains in the system after CFO compensation, which cannot be compensated as long as simple frequency domain processing is targeted. The SIR conditions in OFDM-SDMA systems have been analyzed if CFOs are compensated according to the proposed scheme as well as if they are not. We derived suitable upper bounds for the SIRs depending on the system parameters, which have been verified by numerical simulations. 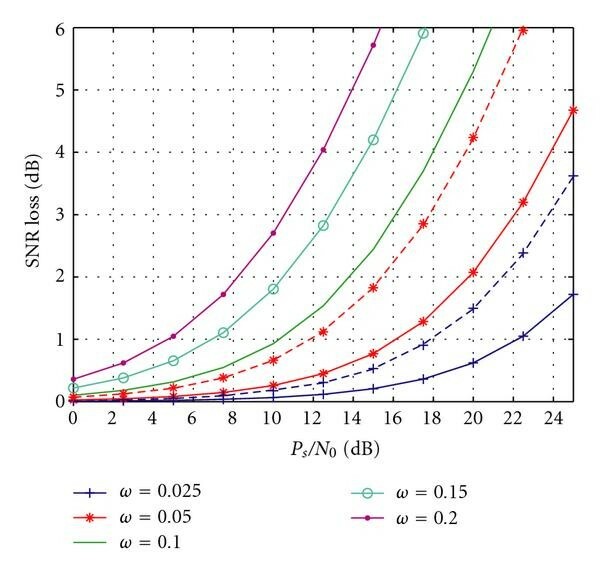 To enable a convenient operation of the proposed scheme, we conclude from the results that the users' CFOs should not exceed values that are much larger than a few percent of the OFDM subcarrier spacing, which classifies this scheme as a technique for fine frequency synchronization. Correspondingly, coarse-frequency synchronization has to be ensured, which can easily be established if the CFO estimates from the downlink are used in the uplink for a proper predistortion of each user's transmit signal, as suggested also in  and practically realized in . Together with this concept, the proposed scheme can be regarded as a convenient solution to synchronize the OFDM-SDMA uplink. Note that this concept based on coarse synchronization also enables to estimate user channels based on common pilot-based channel estimation techniques. Suitable estimates of the users' CFOs can then be obtained from the phase drift of the estimated channels observed over several consecutive OFDM symbols. For , we conclude that the amount of self-interference is vanishingly small; hence there is no need to consider the self-interference separately to account for its special properties.